WHITE, 15 mm ID - 23mm OD - Each - SHIPS FREE! 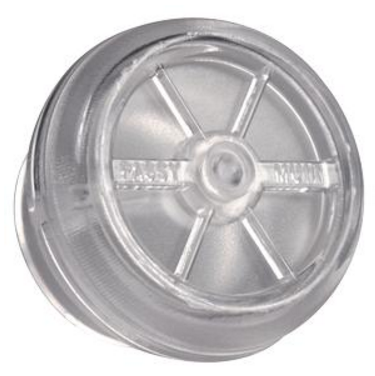 AQUA, 15 mm ID - 22mm OD - Each - SHIPS FREE! 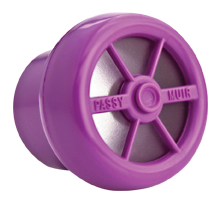 Passy-Muir is a true, industry innovator. The "No Leak" design re-establishes a closed respiratory system and restores subglottic pressure, which improves swallowing and may reduce aspiration. 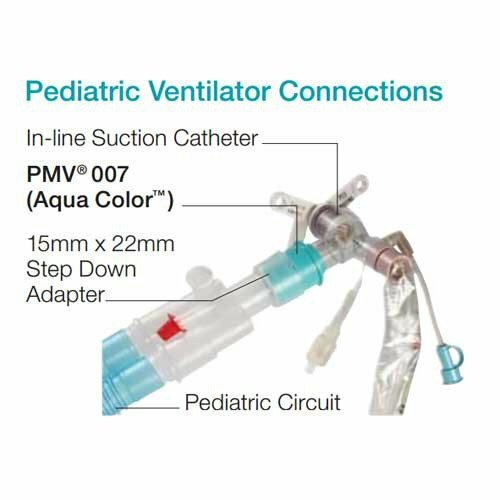 Theses are the only products with built-in speaking valves that can be used interchangeably on or off the ventilator for pediatrics and adults. 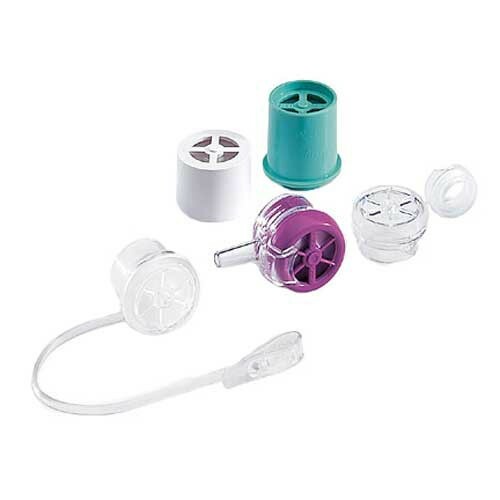 The Trach Valves offer ventilator dependent patients the opportunity to speak uninterrupted without having to wait for the ventilator to cycle, and without being limited to a few words at a time due to loss of air through the tracheostomy tube as experienced by patients using "leak speech". 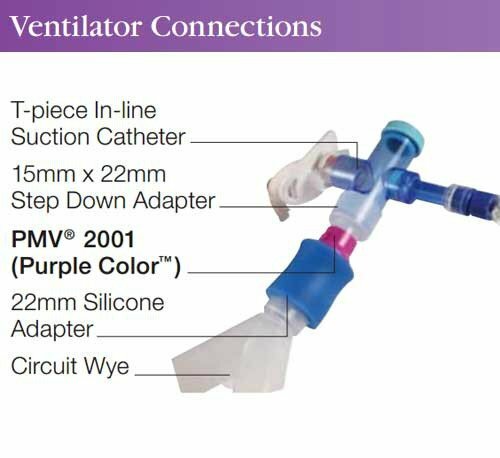 Home Patients or Ambulatory Patients: Use either the PMV2000 (Clear) or the PMV2001 (Purple colored) . 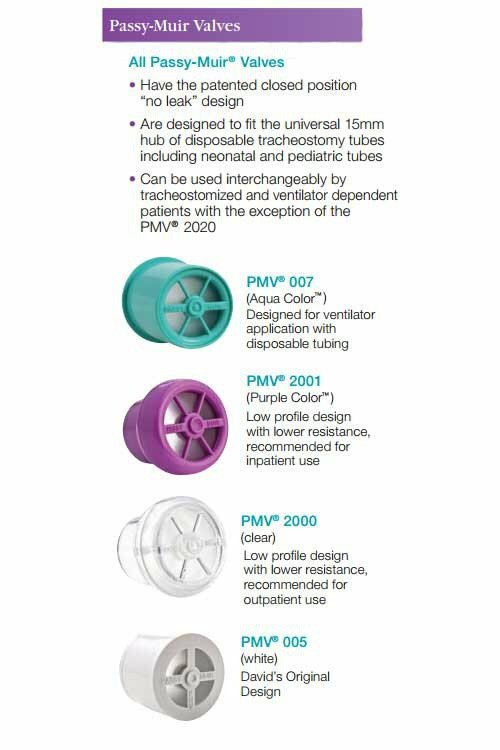 The clearness of the PMV2000 is desirable for patients who would like their valve to be less noticeable and to maintain a lower profile. 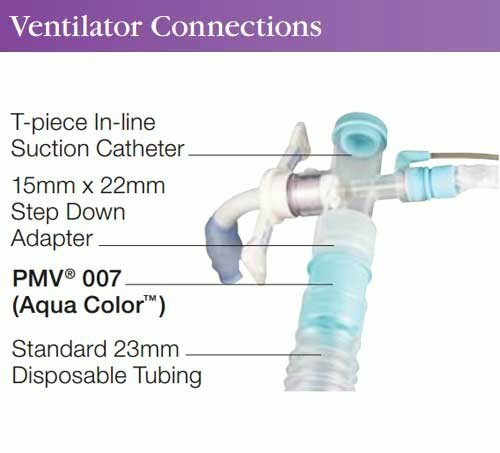 The PMV2000 and PMV2001 can also be used in conjunction with the PMA2000 Oxygen Adapter to deliver low-flow oxygen to the patient. 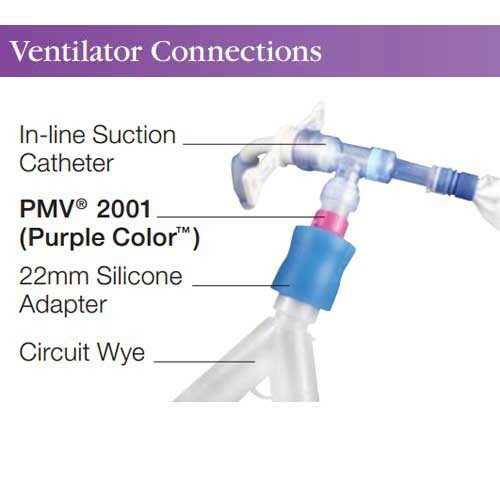 Hospital Patients: Use the PMV2001 (Purple colored) for patients who are in a hospital setting. 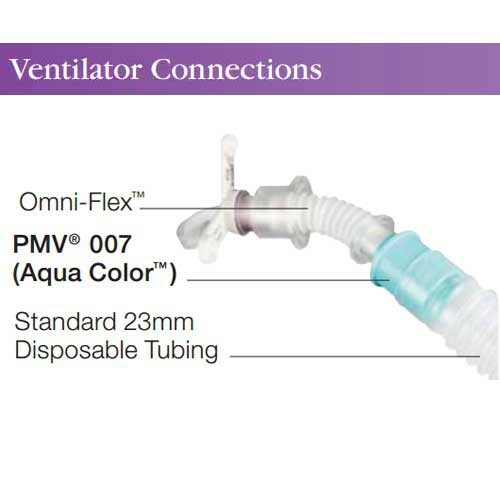 Disposable Ventilator Tubing: PMV007 (Aqua colored) is specifically designed to fit inline with disposable ventilator tubing. 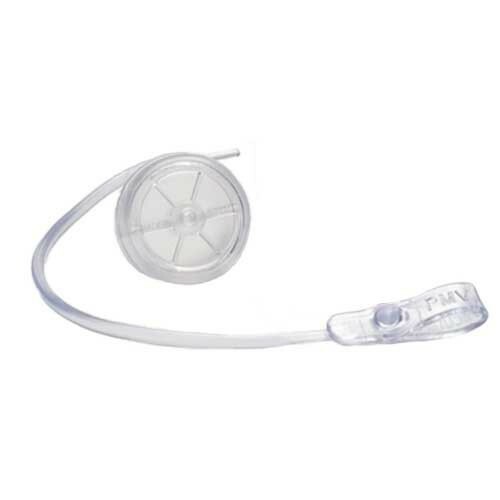 Metal Tracheostomy Tubes: Metal trach tubes with a 15mm inner cannula can be used with the PMV2000 (Clear) . 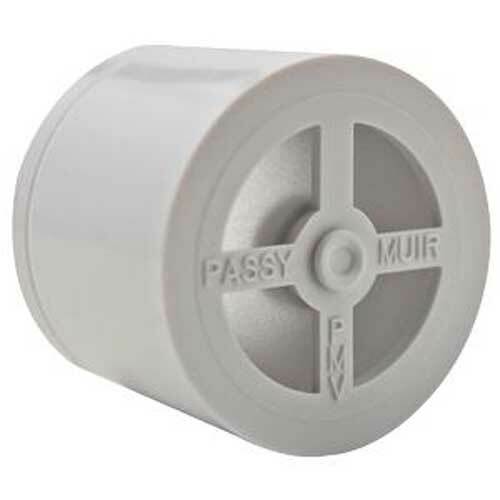 This is the original Passy Muir Value (PMV). While it is more commonly used by non-ventilator dependent persons, it can also be used in-line with mechanical ventilators in conjunction with non-disposable, flexible rubber tubing. This valvie is designed to fit inside adult disposable ventilator tubing. The bright color makes it easier to see while in the ventilator tubing. Use of an adapter may be needed to adapt the PMV to pediatric or various closed suctioning systems. 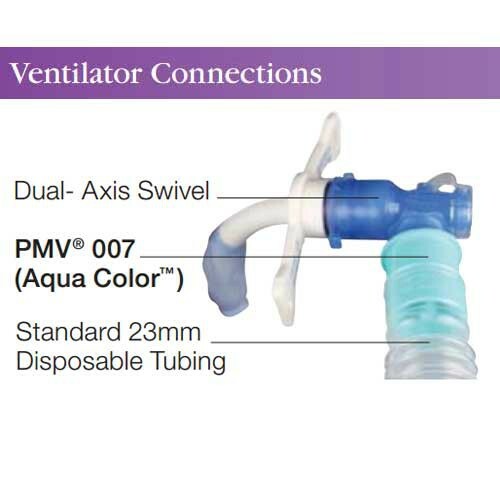 The PMV007 can also be used off the ventilator. Lightweight and opens with even less resistance than its counterpart. Its clear design and lower profile offers less visibility for the more ambulatory patient, although it can also be used in-line with mechanical ventilators in conjunction with non-disposable, flexible rubber tubing. It is simular to the PMV2000 speaking value except for its smaller profile. It is clear in color but is more lightweight and offers a closed position "no leak" valve that attaches to the Premier Medical or Pilling Weck brand metal Jackson Improved sizes 4 through 6 or equivalent trach tubes. It is used for both short-term and long-term tracheostomized patients that are non-ventilator dependent. 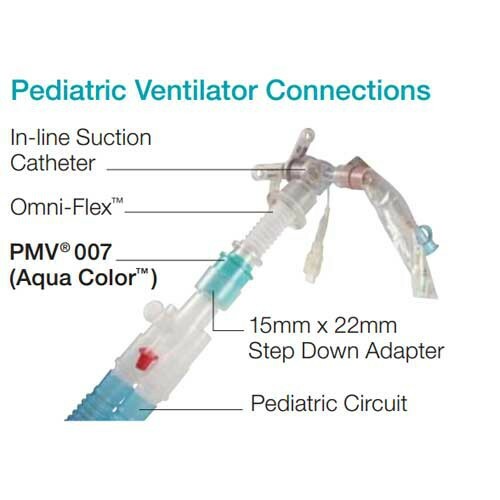 The PMV2020 serves adults, pediatric and neonatal trach patients. 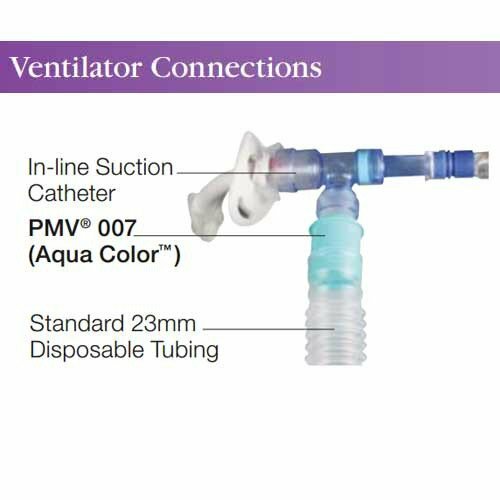 The adapter is used with the PMV2020 to attach to the Premier Medical or Pilling Weck brand metal Jackson Improved tracheostomy tubes (sizes 4 - 6 or equivalent).The PMV2020S Adapter serves adults, pediatric and neonatal trach patients. The valve is identical to the PMV2000 except for its color. It is bright purple to facilitate staff awareness and monitoring of patients. It can be used in-line with mechanical ventilation in conjunction with non-disposable, flexible rubber tubing. 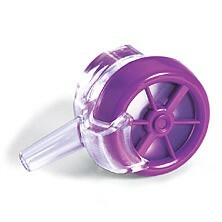 PMA2000 Oxygen Adapter is small, lightweight, clear in color and easily snaps onto the PMV2000 (Clear) or PMV2001 (Purple) valves. The PMA2000 allows for easy delivery of supplemental low flow oxygen (<6L/min) and humidity. Patients can improve their mobility and comfort by utilizing the PMA2000 with oxygen tubing and a small portable oxygen tank, eliminating the need for bulky aerosol tubing. 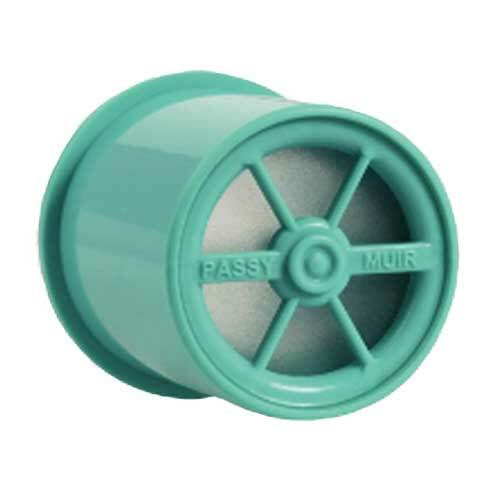 The Passy-Muir PMA2000 adapter may be used in-line with mechanical ventilators in conjunction with non-disposable, flexible tubing, such as a 22mm silicone adapter. When using the PMA2000 adapter, oxygen is delivered in front of the diaphragm of the Passy-Muir Trach Valve. This reduces complications associated with devices that provide continuous flow behind the diaphragm, which may include air trapping, drying of secretions and possible cilia damage. Oxygen Flow: up to 6 LPM. Since ventilator or tracheostomy valves can be easy dislodged by coughing, the Secure-It device keeps the valve attached to the patient. The SECURE-IT Attachment secures the PMV2000, PMV2001 and PMV2020 to the patient. Each of these are designed with a small ring that allows the Secure-It device to attach from the valve to the trach tie to prevent valve loss. Each PMV2000, PMV2001 and PMV2020 comes packaged with one PMVSIS Secure-It. The Secure-It is also available in packets of five. Use of the PMV Secure-It is optional. Application: Prevents loss of trach, ventilator and speaking valves. The Step-Down Adapter is designed for use with the PMV 007 Ventialtor Speaking Valve. 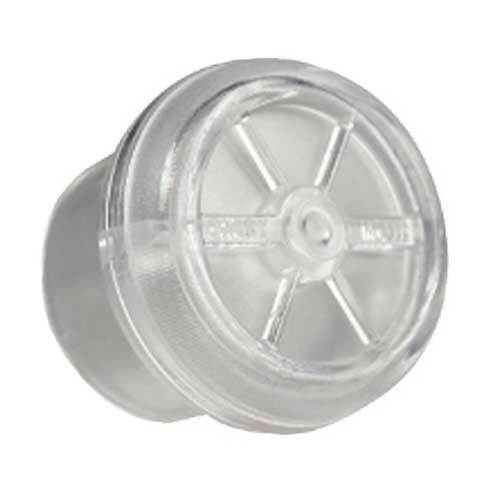 This adapter provides a secure connection between the valve and ventilator tubing, closed suction systems, or other adapters. 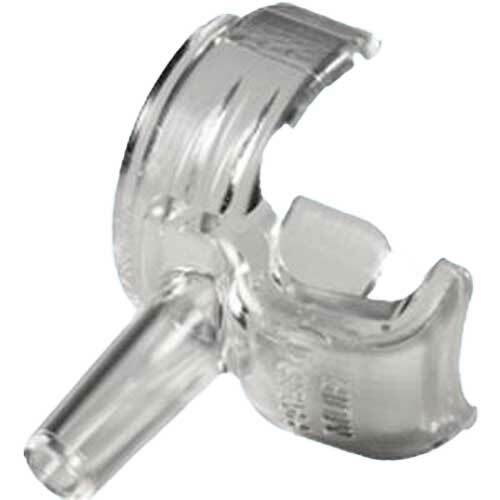 Manufactured with latex-free plastic, the Step-Down Adapter provides clinicians with a way to easily connect the valve inline while the patient is mechanically ventilated. Application: Connect the valve inline while the patient is mechanically ventilated. 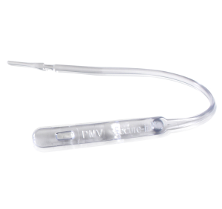 The PMV-AD22 Flexible Silicone Adapter accommodates a variety of uses within a ventilator circuit. Ths adapter is for use with the PMV 2001 Purple Low Profile Speading Valve. 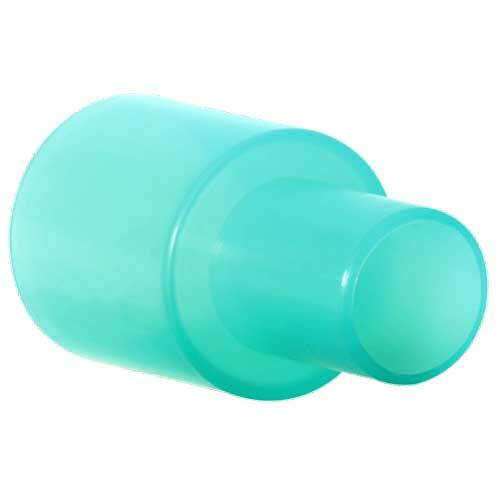 This trach adapter provides a secure connection between closed suction systems, tubing, or other adapters. 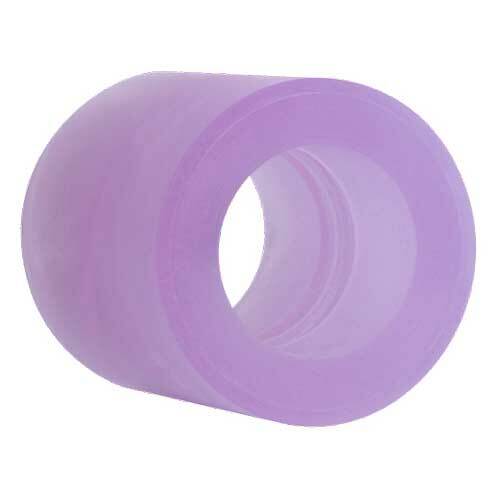 Stretch to fit 22 mm. Application: Provides a secure connection between Valve and tubing, closed suction systems, or other adapters. The closed position– no leak design of the Passy-Muir® Tracheostomy & Ventilator Swallowing and Speaking Valve was invented by David Muir. David had muscular dystrophy and developed the valve as a method for speaking while receiving mechanical ventilation. Soon after its introduction, patients began to discover the positive effects on secretion management and swallowing. Since 1985, there has been a body of independent research published that describes the numerous clinical benefits of the Passy-Muir Valves. To better understand the function and clinical benefits of the Passy-Muir Valve, it is important to first look closely at normal respiration and swallow and the impact of a tracheotomy tube on the functions of the aero digestive tract. In a normal airway, without a tracheotomy tube, inhalation and exhalation occur through the mouth and nose. Airflow moving through the airway enables smell and taste, normal sensation and of course, speech by allowing the air to pass through the vocal folds. During a normal swallow, the larynx elevates and moves forward and acts as a mechanical lever. This action causes the epiglottis to flap over the trachea, protect the airway and direct food or liquid into the esophagus. For a normal swallow, the vocal folds close and breathing temporarily stops. Positive pressure is generated below the vocal folds. Because the swallow is both mechanical and pressure-driven, food and liquid are propelled into the esophagus and at the same time, kept out of the larynx and trachea for a safe and effective swallow. In order to restore normal functioning of the aerodigestive tract, it is imperative that airflow is restored to the upper airway. This is most effectively accomplished by first completely deflating the tracheostomy tube cuff and then by placing a Passy-Muir Swallowing & Speaking Valve on the tracheostomy tube. The use of a Passy-Muir Valve allows air to be inhaled through the valve and tracheostomy tube and then exhaled through the upper airway once the valve closes. Dettelbach, Mark A., et al. "Effect of the Passy‐Muir valve on aspiration in patients with tracheostomy." Head & neck 17.4 (1995): 297-302. Passy, Victor, et al. "Passy‐muir tracheostomy speaking valve on ventilator‐dependent patients." The Laryngoscope 103.6 (1993): 653-658. Stachler, Robert J., et al. "Scintigraphic Quantification of Aspiration Reduction With the Passy‐Muir Valve." The Laryngoscope 106.2 (1996): 231-234. Elpern, Ellen H., et al. "Effect of the Passy-Muir tracheostomy speaking valve on pulmonary aspiration in adults." Heart & Lung: The Journal of Acute and Critical Care 29.4 (2000): 287-293. Kaut, Katherine, Judith C. Turcott, and Mike Lavery. "Passy-Muir speaking valve." Dimensions of critical care nursing: DCCN 15.6 (1995): 298-306. Engleman, Susan G., and Carol Turnage-Carrier. "Tolerance of the Passy-Muir speaking valve in infants and children less than 2 years of age. "Pediatric nursing 23.6 (1997): 571. Gereau, Sezelle A., et al. "Selection of pediatric patients for use of the Passy-Muir valve for speech production." International journal of pediatric otorhinolaryngology 35.1 (1996): 11-17. Jackson, Deirdre, and Stefanie Albamonte. "Enhancing communication with the Passy-Muir valve." Pediatric nursing 20.2 (1994): 149-154. Lieu, Judith E. Cho, et al. "Passy–Muir valve in children with tracheotomy. "International journal of pediatric otorhinolaryngology 50.3 (1999): 197-203. Eibling, David E., and Roxann Diez Gross. "Subglottic air pressure: a key component of swallowing efficiency." Annals of Otology, Rhinology & Laryngology 105.4 (1996): 253-258. MANZANO, JOSÉ L., et al. "Verbal communication of ventilator-dependent patients." Critical care medicine 21.4 (1993): 512-517. What swallowing and speaking valve is recommended for a shiley traquistomy tube 8 LPC 7.6 mm I.D, 12.2 O.D. Our resident has a Shiley 7 trach. Which speaking valve fits this? We don't carry this product directly. It's best to contact the manufacturer for specifics on which speaking valve will fit your needs. We apologize for the inconvenience. This item is now marked correctly for free shipping. If other items are ordered that don't ship for free; however, shipping charges will apply. Wish I didn't have to buy Passy-Muir valves but I do. Found Vitality Medical to be seamless in service and the most economical for this purchase. New valve in original packaging was delivered more quickly than I thought it would be. Am planning to purchase another one now. Of course from Vitality Medical. My only reason for not giving a 5* review is the dang things are so expensive. Which is not Vitality Medical's fault really. It's the fault of the David Muir Foundation which holds the patent.. I ordered and received two PMV Valves for my husband. I am very happy with the product and the price was excellent. Quick shipping and good service! Works as intended. Service was fast and efficient. I received a 15% discount and free shipping the same day I received the product. One day cost me, not to happy about that, otherwise, good job. Just when we badly need a replacement for my dad's trach valves, that was the time that the other company website (where we usually order) was down. So we searched and checked for other website and found you. We ordered it, and was advised of the expected delivery date. I agreed. Then to my amazement, the package arrived a day earlier than your promised date . I am definitely satisfied with this. I got it for my son and he is showing great improvement in swallowing and communicating. The no leak design also helps him to breathe better. Also thank you for fast shipping!